After days of rallying, the market decided that bank stocks had gone too far. With no first quarter earnings out, the fact is that the current quarter could still be tough. Financial shares could still reset lower. And the market reacted accordingly. The Dow fell 122.42 points, or 1.65 percent, to close at 7,278.38, and the S&P and Nasdaq were also down by roughly the same margin. Oil fell one percent to $51.06, and gold was down slightly to $955.80. Expedia Inc. (EXPE) was up most of the day after the online travel destination was raised to "Buy" from the analysts at Citigroup after a big drop yesterday from a competing analyst downgrade. Shares were up a modest three percent to $7.89. General Motors Corporation (GM) already seems down and out, but this morning the company was given a new "SELL" rating by the analyst team at UBS. Shares were about flat at $2.91. MGM Mirage (MGM) was already having a rough week with doubts about its ability to continue as a going concern after it posted a loss this week, and then the S&P sent it a gift in the mail with a credit downgrade. Shares were down six percent at $3.03. The company also joined a long list of firms with "going concern" notices from their accountants. 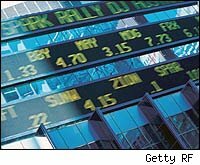 Xerox Corporation (XRX) headed much lower on an earnings warning, but it was not just a warning. It now looks like earnings are going to be down 80 percent from last year in the new forecast. Ouch. Shares were down 19% to $4.35 Amazingly enough, that isn't even a 52-week low.